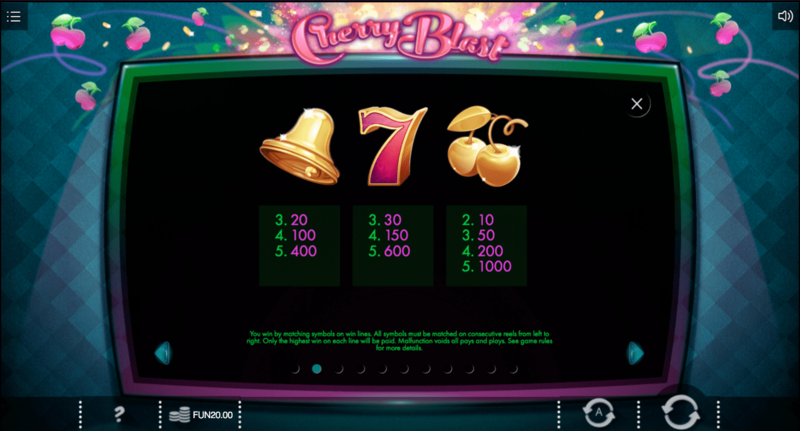 Never has a 5 reel 3 row slot game provided mega entertainment as much as the Cherry Blast online slot game does. Cherries are a common symbol in the slot machine world, but they rarely represent the big winnings. They’re usually the low value in many games and offer a small consolation prize. However, Cherry Blast aims to change this stereotype by making the cherry an exciting centerpiece. This is not your average fruit themed play slot games in the UK and this article will attempt to show you why. You can always tell just how good a slot game can be by looking at the history of its developer. 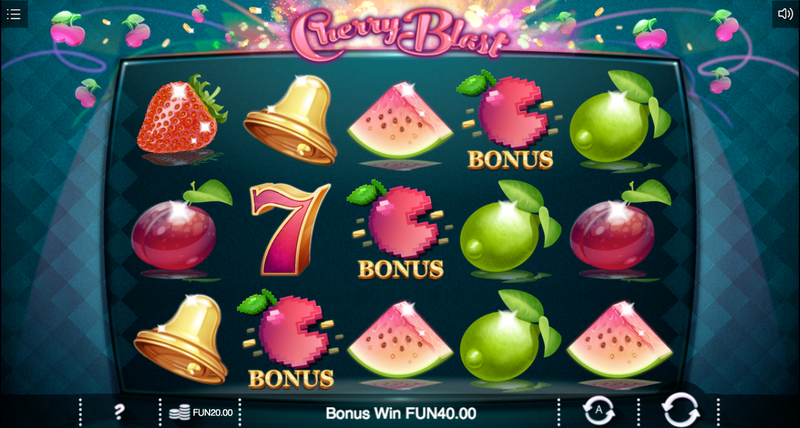 Cherry Blast is an online slot game by Iron Dog Studio. They have close to ten games under their belt and if this game is anything to go by, they are masters of the slot gaming universe. The technicians at Iron Dog believe that a great game needs to have some soul in it. They’re focused on making it a fun and memorable experience for any player. If you love promo's, get the best slot promotions today. The graphics are amazing- we’re talking big, bold designs and several delicious fruit symbols, including watermelons, lemons, golden cherries, plums, berries, kiwi, and more traditional casino symbols like the number 7. At first sight the colours pop and this may be why the background is a neutral blue to create that relaxing atmosphere. The background music also keeps you active throughout and the sound effects fit the game perfectly. The controls are easy to master and are located at the bottom. You could go for the autoplay function if you want to speed the game up. The goal of the Cherry Blast game is to match identical symbols from left to right. The real fun begins when you start to unlock the game’s bonus features. Cherry Bomb Blast- The cherry bomb symbol will get you really fired up in the course of gameplay. It explodes in random directions and pattern combinations. This feature reveals different special icons like scatters, wilds or bonus symbols. Scatters can award prizes while wilds help the player earn more wins. The cherry bomb could also award free spins with up to 9 free plays. When 2 standard cherries pop up and explode, they reveal either super scatters, super wilds or both! This brings you closer to winning the major prize. Wild symbol- The wild symbol in this slot is the Golden Crown. It replaces the other symbols and increases your chance of picking winning combinations. It appears frequently on reels and helps you top up your balance. Scatter symbol- The gold and red star symbol is the scatter. This added feature can help you score free spins. Bonus rounds- The highlight of the game might just be when you enter the Dash Bonus Round. It’s a mini-game that replicates the Pac - man style except the main character here is a cherry that eats up everything in its path. Players will need to land at least three cherries in a certain combination to unlock it. Each pellet eaten earns 1X the coin value. Things get even more exciting when you have to find ways of escaping the special blocks that appear in your way. The game ends when you’re killed by the blocks or if you successfully find a way out of the maze. This is a great game to play if you’re looking to pass time while at the airport, pub or while waiting for someone. What you’ll appreciate most about the game is how easy it is to progress to the next level and the satisfaction that comes with winning back double or triple the money you spent. Are you ready to blast these cherries?